Papua New Guinea is located in Oceania. Papua New Guinea is bordered by the Pacific Ocean, Bismark Sea, Solomon Sea, Coral Sea, and Indonesia to the west. Google Earth is a free program from Google that allows you to explore satellite images showing the cities and landscapes of Papua New Guinea and all of Australia in fantastic detail. It works on your desktop computer, tablet, or mobile phone. The images in many areas are detailed enough that you can see houses, vehicles and even people on a city street. Google Earth is free and easy-to-use. Papua New Guinea is one of nearly 200 countries illustrated on our Blue Ocean Laminated Map of the World. This map shows a combination of political and physical features. It includes country boundaries, major cities, major mountains in shaded relief, ocean depth in blue color gradient, along with many other features. This is a great map for students, schools, offices and anywhere that a nice map of the world is needed for education, display or decor. If you are interested in Papua New Guinea and the geography of Australia our large laminated map of Australia might be just what you need. It is a large political map of Australia that also shows many of the continent's physical features in color or shaded relief. Major lakes, rivers,cities, roads, country boundaries, coastlines and surrounding islands are all shown on the map. Abau, Aiyura, Amanab, Arawa, Balmuru, Barakau, Bensbach, Bogia, Boku, Buin, Cape Rodney, Daru, Gagan, Goroka, Hutjena, Ihu, Kainantu, Kalalo, Kambof Mission, Karkar, Kavleng, Kerema, Kimbe, Kiunga, Komo, Koripobi, Kundiawa, Lae, Londolovit, Lorengau, Lumi, Madang, Maprik, Matukar, Morehead, Mount Hagen, Nadzab, Namatanai, Paili, Pomio, Popondetta, Port Moresby, Rabaut, Samarai, Sibidiro, Tefehui, Usino, Vanimo, Wabag, Wabo, Wafam, Wau, Wewak and Wonenara. Astrlabe Bay, Bismark Sea, Central Range, Coral Sea, Fangalawa Bay, Fly River, Goschen Strait, Gulf of Papua, Kali Bay, Kimbe Bay, Lake Herbert Hoover, Lake Murray, Montagu Harbour, Open Bay, Owen Stanley Range, Pacific Ocean, Sepik River, Solomon Sea, St. George's Channel, Vitiaz Strait, Wide Bay and Ysabet Channel. Gold, copper and silver are some of the metal resources in Papua New Guinea. The country has fuel deposits which include natural gas and oil. Other natural resources include timber and fisheries. Papua New Guinea is situated along the Pacific "Ring of Fire" and this country is subject to active volcanism. There are natural hazards which occur, including frequent and sometimes severe earthquakes, mud slides, and tsunamis. 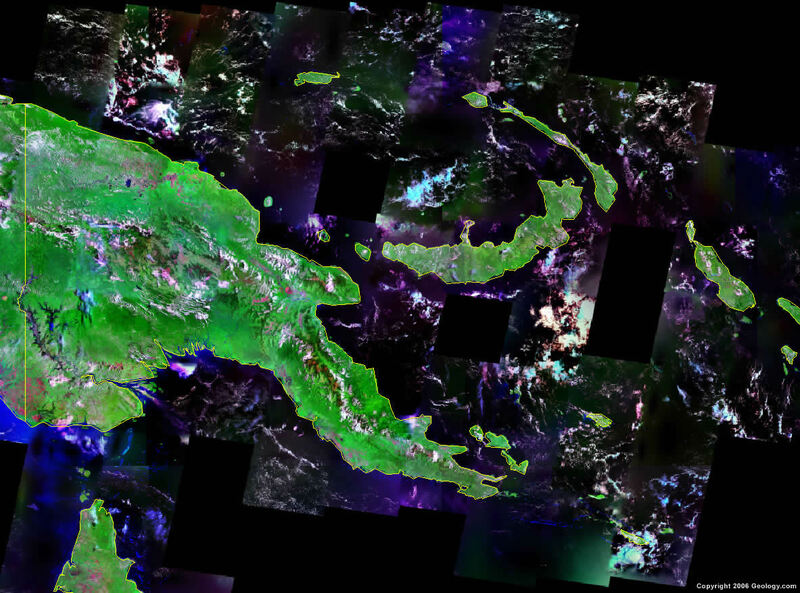 The rain forest of Papua New Guinea is subject to deforestation as a result of the growing commercial demand for tropical timber. Another environmental issue is the pollution caused by mining projects. The country has also recently witnessed severe drought.